An Historical Sketch of the Church Missionary Association of the Eastern District of the Diocese of Massachusetts. Bishop Seabury and Bishop Provoost: An Historical Fragment. No place: no publisher, 1862. The Connection of the Church of England with Early American Discovery and Colonization. Life Lessons from the Book of Proverbs. Journals of General Conventions of the Protestant Episcopal Church, in the United States, 1785-1835, volume one. Journals of General Conventions of the Protestant Episcopal Church, in the United States, 1785-1835, volume two. Journals of General Conventions of the Protestant Episcopal Church, in the United States, 1785-1835, volume three. Anglo-Continental Sympathy with Continental Reform. A Sermon Preached in Westminster Abbey, on Sunday, October 17th, 1875. London: William Wells Gardner, 1875. A Sermon Preached in Emmanuel Church, in the City of Baltimore, Md. on the Twenty-Second Sunday after Trinity October 22nd, 1883 on Occasion of the Consecration of the Rt. Rev. Alfred Magill Randolph, D.D. Assistant Bishop of Virginia. New York: Thomas Whittaker, 1883. The Election of the First Bishop of Connecticut, at Woodbury, on the Feast of the Annunciation, 1783. Davenport, Iowa: Glass and Hoover, 1884. A Discourse delivered in the Cathedral of Our Merciful Saviour, at Faribault, Minnesota on the Eve of the Centenary of the Reverend Samuel Seabury, D.D., Oxon., to the Episcopate of Connecticut, by the Bishops of the Catholic Remainder of the Church in Scotland, at Aberdeen, November 14th, A.D., 1784, and repeated in the Cathedral at Davenport, Iowa November 16th, A. D., 1884. The History of the American Episcopal Church 1587-1883, volume one. The History of the American Episcopal Church 1587-1883, volume two. The Men and Measures of the Massachusetts Conventions of 1784-85. A Discourse Delivered in Christ Church, Cambridge, Mass., before the Eastern Convocation of the Diocese of Massachusetts, on Occasion of the Celebration of the Centenary of the Founding of the Diocese. Boston: George F. Crook, 1885. The Centenary of the British Colonial Episcopate. 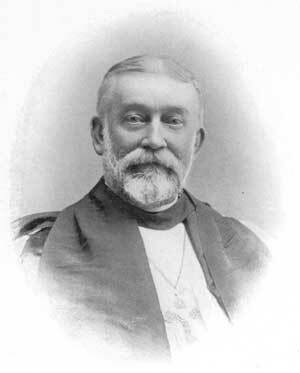 A Sermon Preached in S. Paul's Cathedral, London, Wednesday, June 22, 1887 on Occasion of the 186th Anniversary of the Society for the Propagation of the Gospel in Foreign Parts. Grinnell, Iowa: Published for S. Paul's Church, 1887. The Episcopate in America: Sketches, Biographical and Bibliographical, of the Bishops of the American Church, with a Preliminary Essay on the Historic Episcopate and Documentary Annals of the Introduction of the Anglican Line of Succession into America. An Historical Address Delivered in St. John's Church, Dubuque, Iowa on Occasion of the Semi-centennial Celebration of the Organization of the Parish.